This delicious Gingerbread Syrup is perfect for Christmas and Winter time, or for those who love it as much as we do, all year round! With aromatic spices combined with delightful sweet notes, it is great in a latte, cappuccino or any drink of your choice. Hints of cinnamon, clove and molasses combine to form this delightful gingerbread flavour. With the highest-quality ingredients used in this product, you will get a great flavour every time. How Do I Use Gingerbread Coffee Syrup? When adding to your coffee, it really is personal preference as to how much sweetness you would like. We suggest starting with a little and adding more to adjust to your taste. 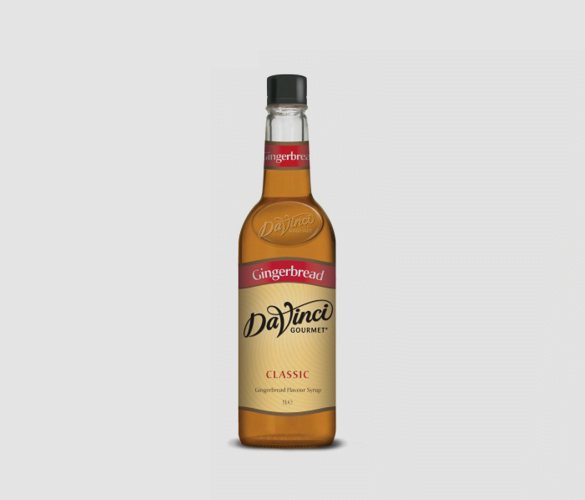 However, this syrup can be used in many more recipes than just coffee. We’ve tried it lots of different ways such as in tea, desserts and milkshakes and it works perfectly! To show you just how versatile this product really is, we have tested these two recipes out below and would love to share them with you. This recipe is from Taming Twins and is moist and delicious. Grease 2 cake tins of the same size and preheat your oven to 180°C. Mix your eggs in one at a time. Add in your flour and ginger. Add in the coffee and stop stirring just before it combines to achieve a swirl pattern affect in your cake. Spoon half into one tin and half into the other. Bake for around 30 mins. You can test to see if it is cooked by putting a skewer in the middle, it is done when the skewer comes out clean. For the icing, firstly beat the butter until it is light and fluffy. Then, beat in the icing sugar and syrup. If the icing is a little hard, you can add a teaspoon or two of boiling water to soften it up. Once the cake is completely cooled, sandwich the two halves with the icing and add some on top. This recipe is from the Telegraph and is a delicious twist on the traditional martini. Firstly, you will need to make the Christmas vodka. This is pretty easy to do, it just needs to be made a week in advance. Mix 1 bottle of vodka in a bowl with 4 cloves, 1/2 a cinnamon stick, 1 slice ginger, 1 nutmeg (cracked), 20ml maple syrup and the zest of 1/2 an orange. Seal with cling film and leave at room temp for a week, then use a fine strainer to separate the ingredients from the vodka. Mix all the ingredients together with ice until they are all cold. Strain into a frozen martini glass and flame an orange zest over the drink then discard. Hang the candy cane over the glass and enjoy!